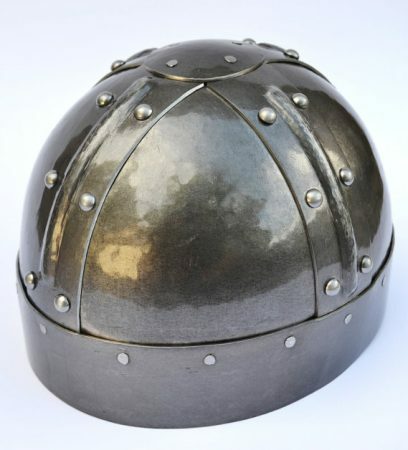 This helmet is modelled after those worn by Vikings and central Europeans in the 7th-10th centuries, and is modelled closely on an example in a private collection. It consists of four plates in a re-enforced spangen-frame, sturdily riveted together with heavy, domed rivets. This helmet would look very similar to the helmet from Gjermundbu with the addition of an optional ‘spectacle’ visor. Our version is made of 16 gauge steel, as shown here, rough from the hammer. 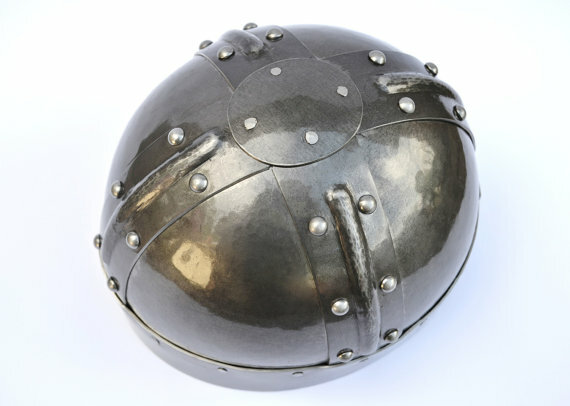 A chin-tie is included in the price of the helmet. All armour is custom-made to your measurements.